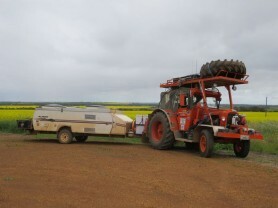 The Chamberlain 9G Tractor Club ‘Seachange Trek’ commenced on Thursday 4th August, 2016 at Cervantes, a small but growing fishing town. The itinerary was planned to create a slower paced Trek, allowing time to really enjoy the scenery and wildflowers, as well as participating in some beach fishing and sightseeing along the way. Thirty two members participated in the Trek. 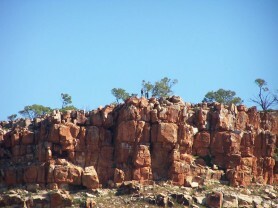 Everyone enjoyed their time sightseeing and visiting the Pinnacles Desert while at Cervantes. 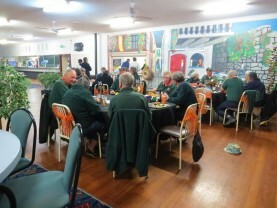 The decoration of the area set aside when we gathered at the Community Club for dinner was very much appreciated by everyone. 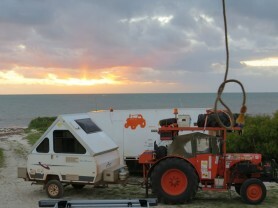 We left Cervantes and travelled north along Indian Ocean Drive to Jurien Bay. 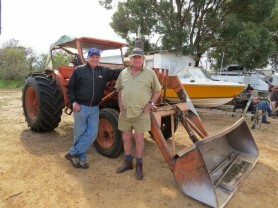 While at Jurien Bay we were invited to visit Ian Boyd’s private motorcycle collection. There were 76 bikes in the showroom. 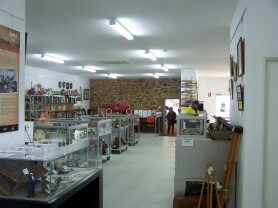 Ian started collecting in 1987. As part of the collection, he has every model of the Vincent HRD from 1936-1955. As Ian commented, he is in Vincent heaven! Along with the motorcycles there were Jaguar cars, speed cars and lots of memorabilia. Later that afternoon we arrived at Knobby Head. Camp sites were soon selected, and it wasn’t long before the socialising began and a magnificent meal (thanks to Cumber, Jim and Derek) was well underway. There was a camp fire outside and a wood burner in the shed, so no one was left out in the cold. 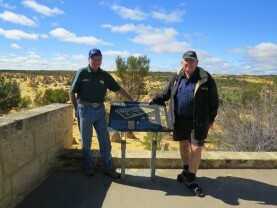 Chance to visit the Pinnacles – Ron & George. 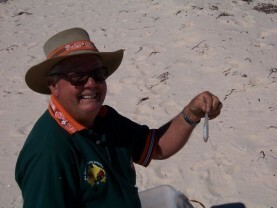 After a great couple of days eating, beach walking and fishing we moved on to Carnamah via Lake Indoon and Eneabba. Soon after leaving Eneabba we called in for a brief visit to a very large almond orchard which is owned by the Indian Ocean Company. 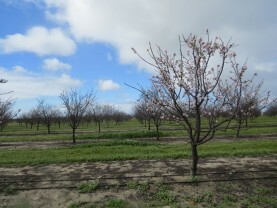 We had a guided tour of the orchard which included a very interesting and informative conversation with the Manager. The Club received a very friendly welcome from the Carnamah community, with the Bowling Club providing a sumptuous roast lamb evening meal. 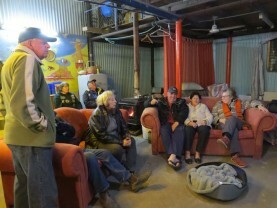 We visited McPherson Homestead, where we had a very interesting guided tour. From there we were invited to look through the Historical Museum. There were many items on display and the presentation was excellent. 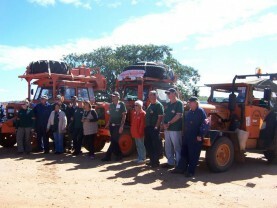 We also visited the Tractor Museum which was particularly interesting for our own tractor enthusiasts. 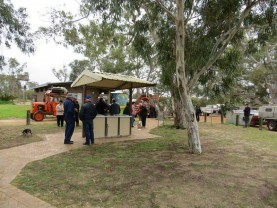 Our next stop was Mingenew Expo. 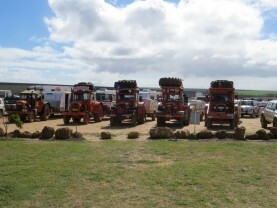 The tractors were on display for the first day of the expo. The weather was perfect and everyone enjoyed the opportunity to wander at leisure around the displays. The following morning we made our way out to Coal Seam Conservation Park. 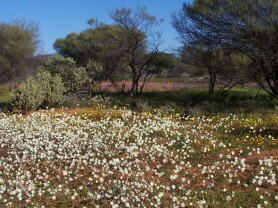 There was a beautiful show of wildflowers as we made our way up to the lookout. 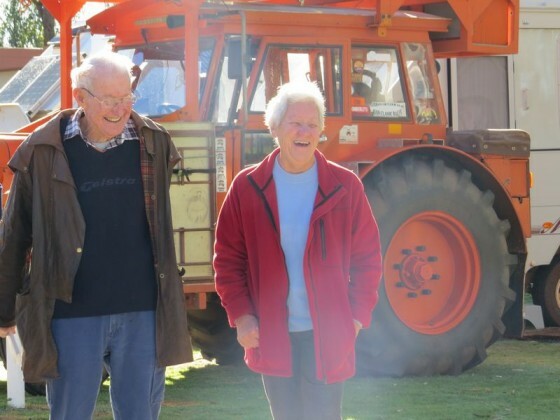 Chris Lewis from ABC Midwest and Wheatbelt was visiting the Park at the time and he requested an interview with some members of our club, along with footage of the tractors. The video can be seen on the ABC Midwest and Wheatbelt Facebook page. The trek continued through beautiful scenic countryside to Allendale Pool, then on to Chapman Valley where we camped the night at Stuart and Di Adamson’s Valley View Farm. 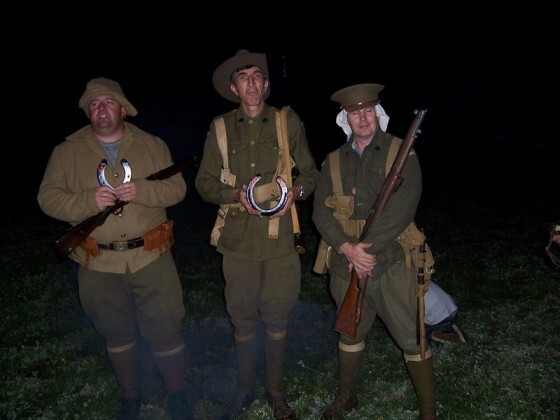 A re-enactment of the capture of Leane’s Trench from the Turkish Army by the West Australian 11th Battalion AIF was provided by three soldiers. 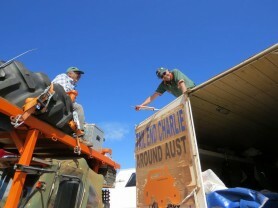 They are part of the Living History Group and Gallipoli Trench Re-creation Project based in Geraldton. It is a world first Gallipoli project. Two decorated horseshoes were presented to the soldiers from the Chamberlain 9G Tractor Club. There was also a monetary donation to the Living History Group from our members present which would assist towards the upkeep of the trench. 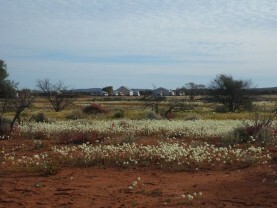 We set off from the farm the following morning for Northampton via the Chapman Valley. This was a beautiful drive through very colourful, undulating countryside. We called in for Devonshire tea at Oakabella café, which was followed by a tour of the historic homestead and outbuildings. 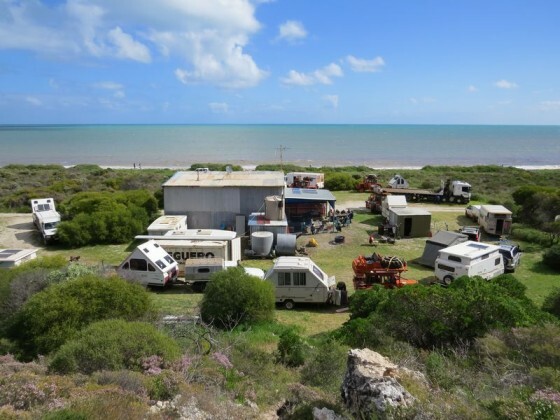 After a short stop-over for some quick shopping in Northampton, we proceeded on to the Port Gregory Caravan Park where we stayed for 2 nights. 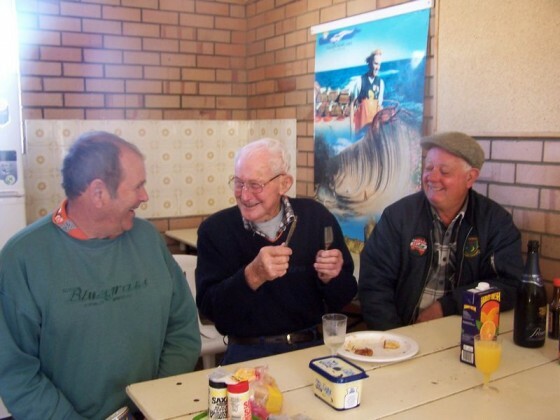 A sausage sizzle was provided by the owners of the caravan park which was a great opportunity to meet with others at the caravan park, and raise some funds for our two charities. 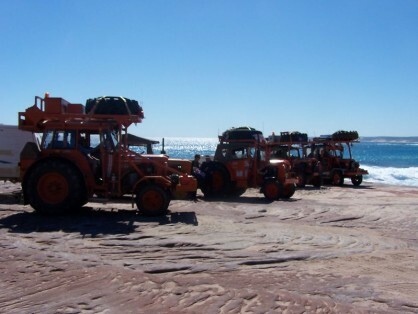 We left Port Gregory and called in to Lucky Bay for a short break, then continued on to Kalbarri. 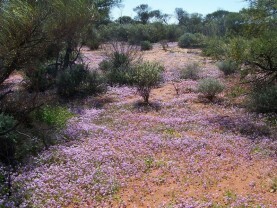 The scenery around Kalbarri was spectacular. 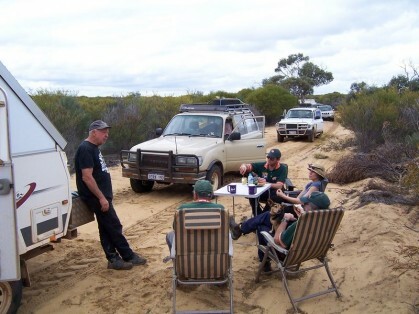 We left Kalbarri and camped the night at Murchison House Station (old army site near the river). The following morning we left, with the Station’s permission, to continue on through the station to the vermin fence. We camped at the fence then continued further along the Zuytdorp Cliffs the following morning to the site of the Zuytdorp wreck. It was a slow trip along the cliffs as the road was very rough. Many whales could be seen offshore from our camp site on the cliff. The scenery and sunsets were beautiful. The weather was closing in as we left the camp site the following morning to travel east along the vermin fence. 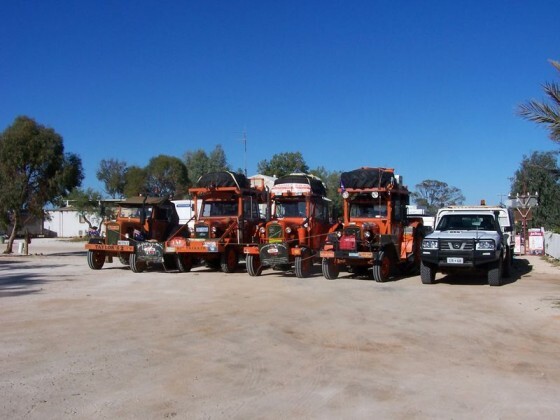 We eventually arrived at the junction with North West Coastal Highway and made our way north to the Billabong Roadhouse, where we spent a rather cold, windy night. Before leaving the following morning everyone gathered while Bobby King conducted the commemorative ‘Battle of Long Tan’ ceremony. Bobby’s brief address, which included music, was a very moving ceremony. 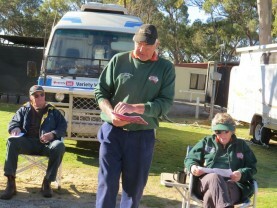 We arrived to spend one night at Hamelin Pool Caravan Park. 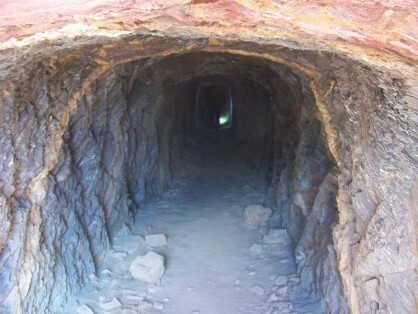 A viewing walkway provided excellent access to visit the stromatolite site. An excellent information DVD and presentation at the Old Telegraph Museum was held in the evening. We continued on to Denham, calling in to several tourist attractions along the way. 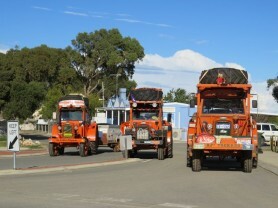 We arrived at Shark Bay Caravan Park in Denham on Friday 19th August. All members took advantage of the time allowed in Denham to visit the Ocean Park Aquarium, Little Lagoon, Peron Homestead and Monkey Mia. 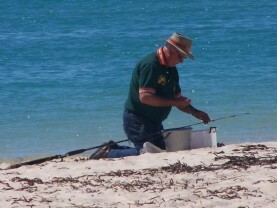 Some members travelled up to Cape Peron while others enjoyed a boat cruise and a spot of beach fishing. A special group tour for the Chamberlain 9G Club members was arranged to visit the Blue Lagoon Pearl Farm which was enjoyed and appreciated by everyone. The CEO of the Shark Bay Shire, Paul Anderson and his wife Wendy, joined us for an evening meal at the Waterfront Restaurant. Paul gave an interesting, informal talk about Denham, the redevelopment of the foreshore, and the upcoming celebration of the Dirk Hartog 400th anniversary with the Duyfken replica undertaking a voyage and exhibition program. Back on the road on Monday 22nd August to travel back down the highway to Butcher’s Track. 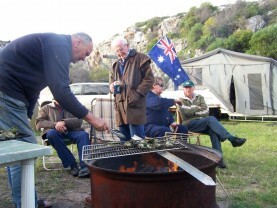 This was one of our more entertaining bush camps with each member providing either a story, poem, song or short quiz. Once we got the ball rolling it was one laugh after another and everyone had a great night. 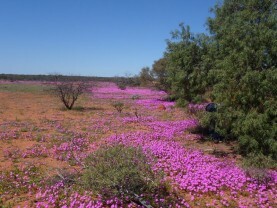 On our way to Murchison Settlement we called in to Errabiddy Bluff which was a very scenic area. Two of our more energetic members made their way to the peak while the rest of the group drove up to the lookout. 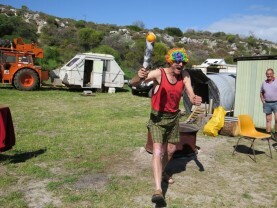 The facilities at Murchison Caravan Park were excellent. After a very interesting visit to the museum the following morning we all made our way to the next bush camp. 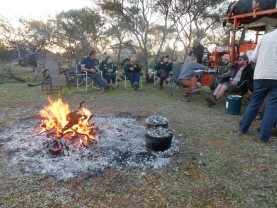 This was another great night, with everyone providing some special item of entertainment after we had all enjoyed a huge communal camp oven meal. 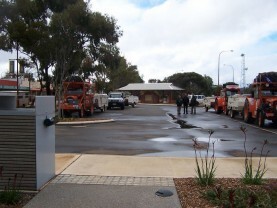 We arrived at the Yalgoo Caravan Park and, again, found the facilities to be excellent. After visiting the museum at the old police station and various other places of interest, we all made our way to the hotel for an evening meal. The following morning we visited Joker’s Tunnel before moving on to Thundelarra Station. 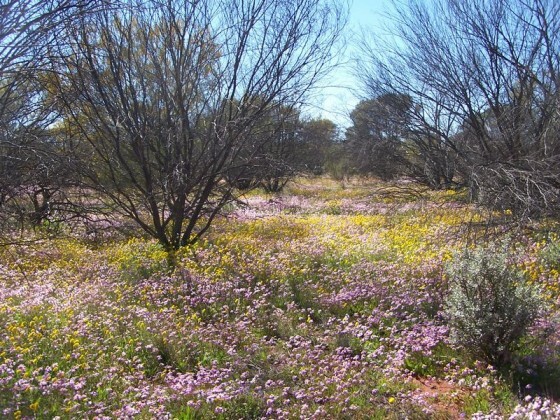 Thundelarra is now a conservation reserve which was previously run as a pastoral lease. We spent the afternoon wandering around the station, visiting the many restored out buildings, the huge shearing shed and walking amongst the wildflowers on our way to the billabong. The wetland is regarded as an important habitat and breeding ground for water birds. 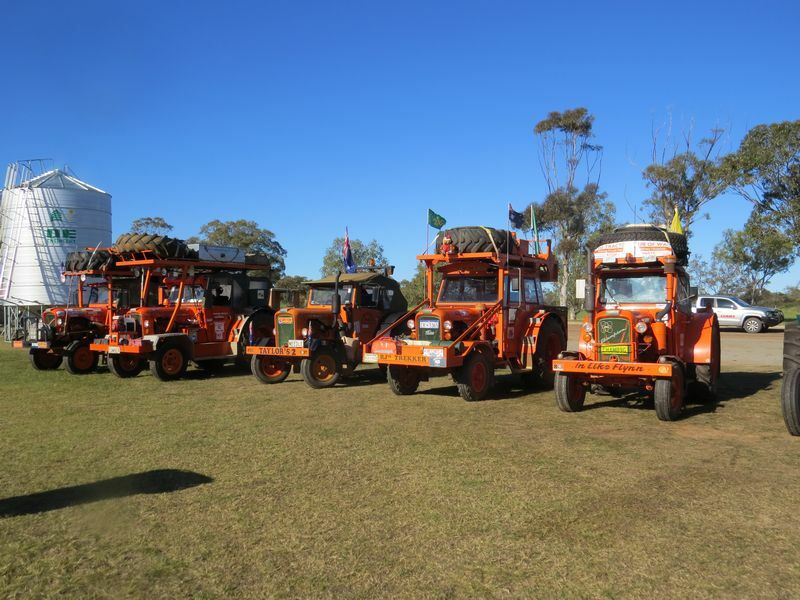 Due to the constant rain the previous night, the off- road conditions had deteriorated. 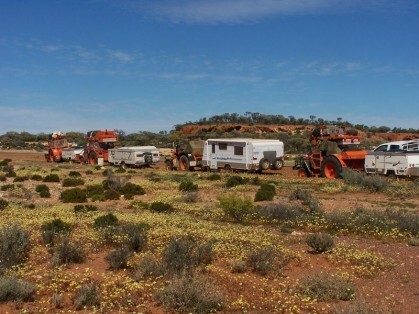 It was agreed to travel back to Yalgoo on the bitumen rather than continue, according to the itinerary, along unsealed roads. 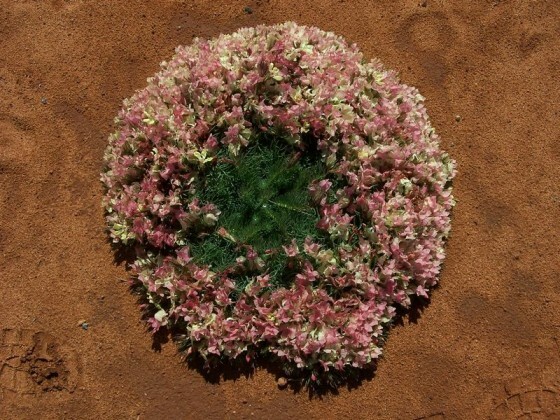 While travelling from Yalgoo to Morawa we made many stops along the way to photograph the wreath flowers that could be seen along the road verge. As the saying goes, ‘all good things must come to an end’. When we arrived at Morawa it was time to say farewell to our fellow travellers and make our own way back to our various home towns. Thank you Cedar, Allan and Cumber for the various roles you played in making this Trek possible. 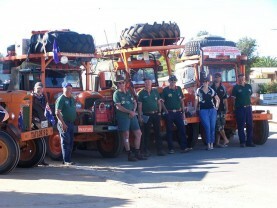 We all had a great time and raised $2,776.00 for the RFDS and Children’s Hospitals.